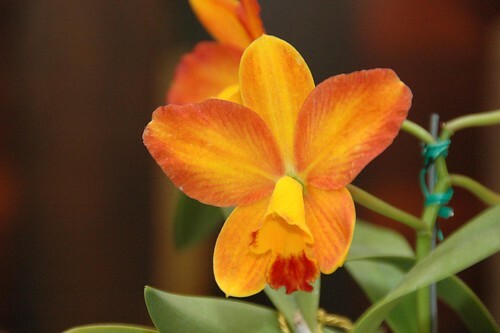 Here's the second round of photos from yesterday's visit to the 2008 Western North Carolina Orchid Show at the North Carolina Arboretum. 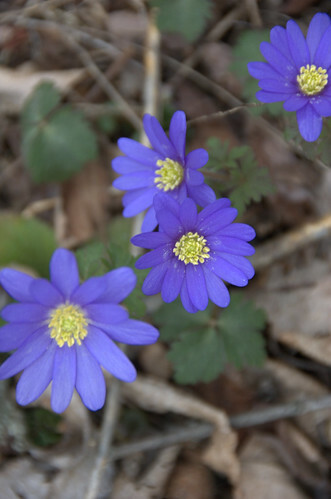 There are the flower portraits, the closeups and other details, of the stars of the show. 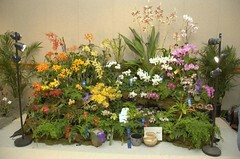 I'm ignorant of orchids. 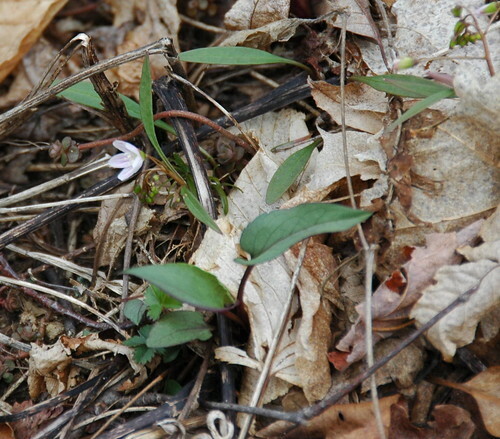 I tried to take photos of labels so I could identify the flowers later. 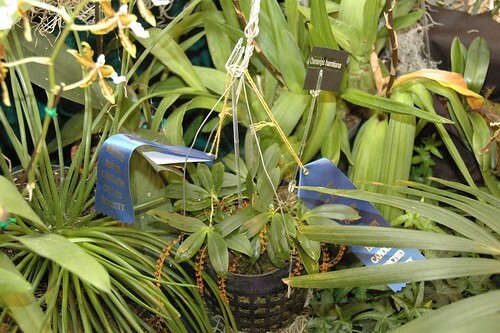 But the labels weren't always so obviously associated with the plants. I transcribed the names as best I could. So take any names provided here with heaping teaspoons of salt. 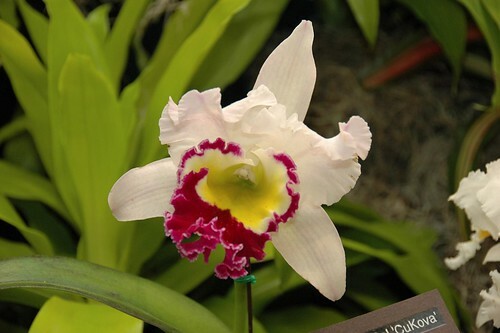 Another unknown beauty, perhaps a Cattleya relative? 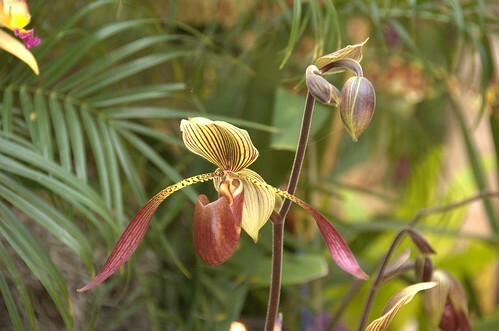 The name on the label was Paph. 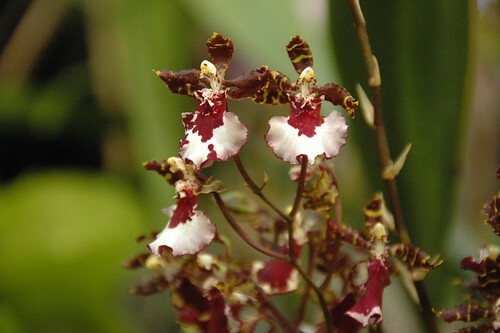 JulisRothschildianum 'Eureka' x Lowii 'Princehouse' AM/AOS. 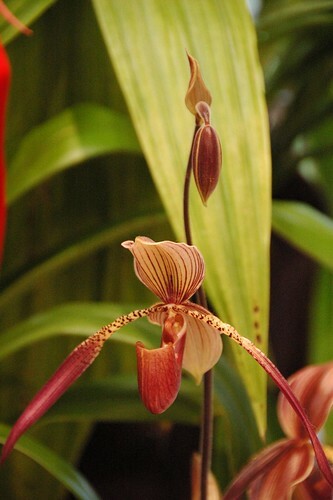 I guess this is a hybrid of two "Paph." 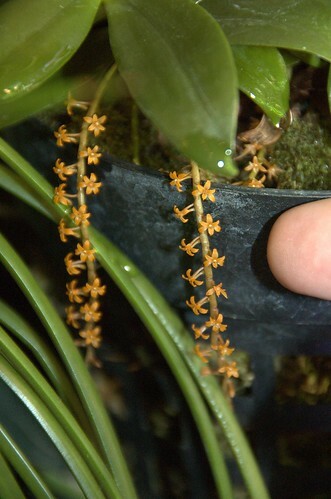 (Paphiopedalum?) 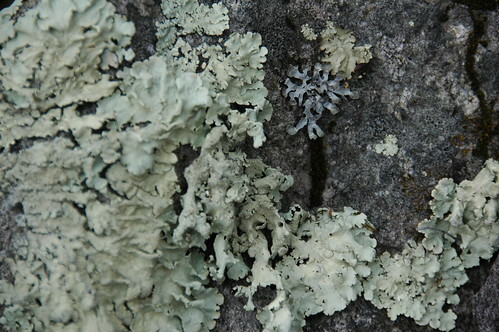 varieties. Anyone want to translate? 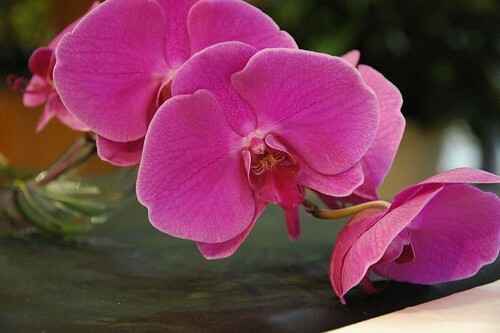 I'll close out with two detailed portraits of two amazing orchids. 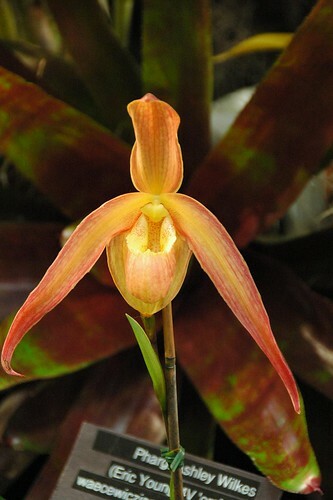 This is a detail of Phrag. 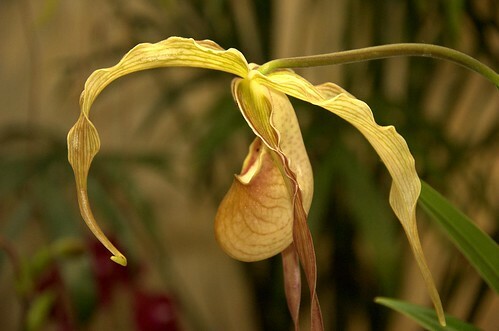 caudatum, some kind of ladyslipper orchid. That's beautiful enough. 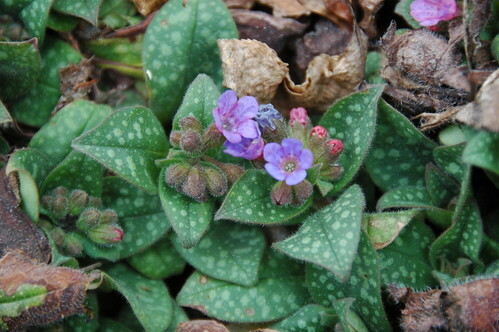 But check out the lateral petals. 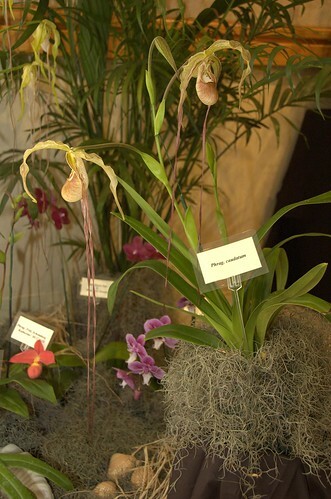 They've evolved into straps hanging down over 18" on each side of the bloom. 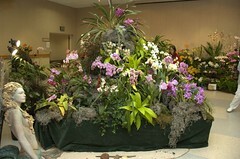 It's a little hard to pick out from the mass of foliage surrounding it, but the hanging basket (seated, in this setting) in the center of the photo contains a specimen of Chamaengis harotiana. 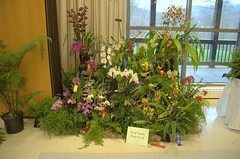 You can see this won First Place in something. It doesn't look like much at first glance. Let's take a closer look. Hard to appreciate it, so I put my fingertip in the photo for scale. 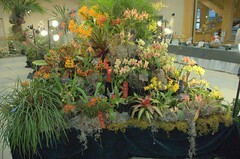 Ten of those flowers could fit on my fingernail. 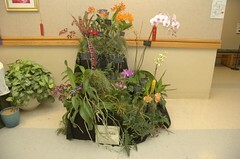 This morning I attended the second day of the 2008 Western North Carolina Orchid Show and Sale at the North Carolina Arboretum. 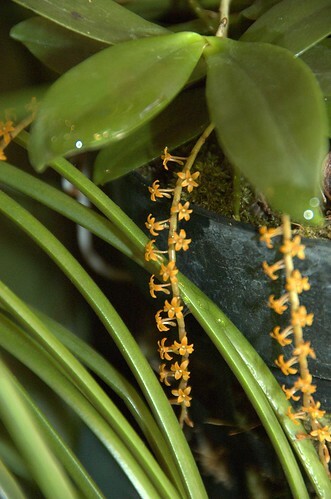 Although I've gardened outdoors for many years, I cannot keep a houseplant alive. 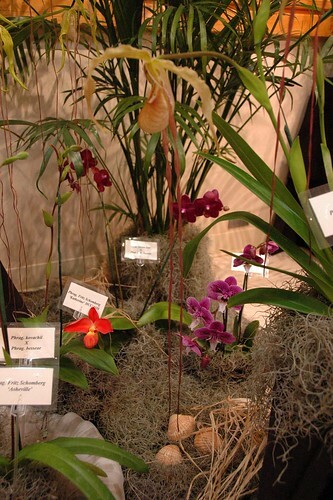 I certainly haven't ventured into the Orchid world. My experience of an event like this is much like how I describe myself going to Sunday services: like a dog in church. 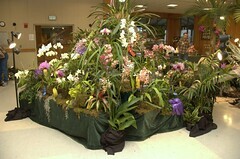 I enjoy the sights and scents for their own sake, and have no interest in tapping into the deeper religion of the event. 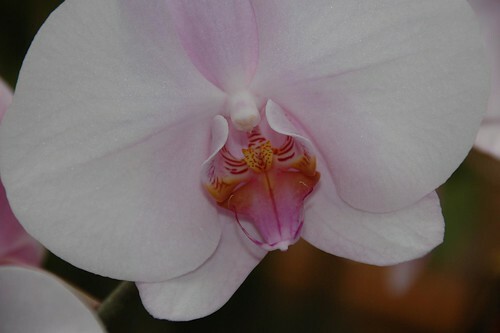 So here is my report from today's visit, emphasizing the visual experience, which was more than satisfying to this orchid-ignorant gardener. 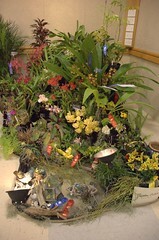 This first part gives the overview and most of the exhibits. When I get home I'll be able to filter through the flower portraits for Part 2. 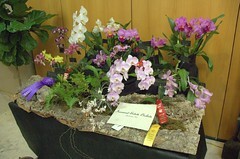 The event was sponsored by the Western North Carolina Orchid Society (WNCOS). 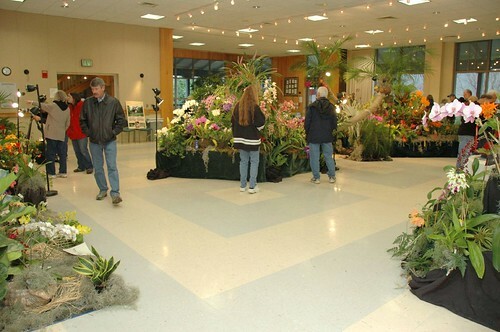 The event was held in the Education Building of the North Carolina Arboretum. 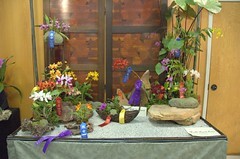 Specimens from WNCOS members occupied the central display. All of these photos are from the members exhibit, taken from different vantage points around the room. 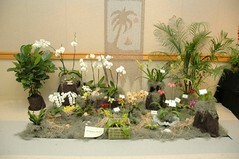 Displays from vendors and other orchid societies covered the perimeter of the room. 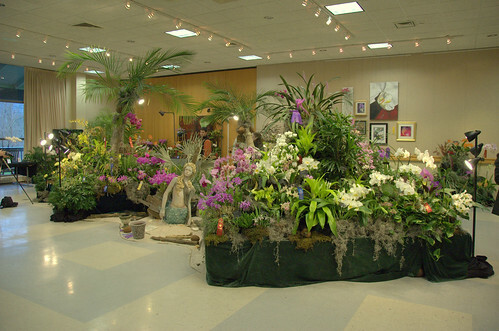 The vendors tables themselves occupied two other rooms. It's hard to say what the breakdown would be at today's event. Men seemed to be in the majority, at least while I was there. As for the rest of it, I would not presume to infer. 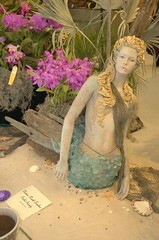 I'll just say that the orchids weren't the only eye-candy on hand today. This afternoon I had the pleasure of visiting with CC of Outside Clyde. 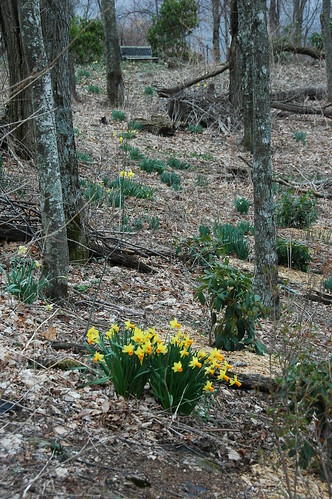 I've been following his chronicles witnessing the succession of growth and bloom on the resident gardeners' hillside. This is just my small contribution. There's no single vantage from which you can take in the entire hillside at once. 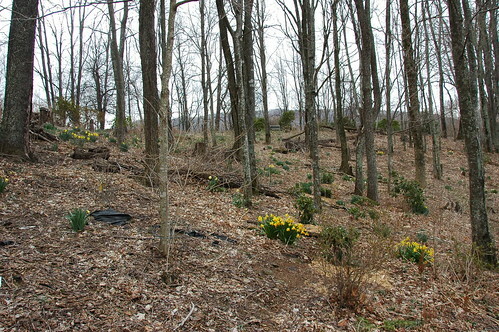 The trails wander and intersect organically, having evolved over three decades of clearing, planting and gardening. The trails are rough, and steep at times. 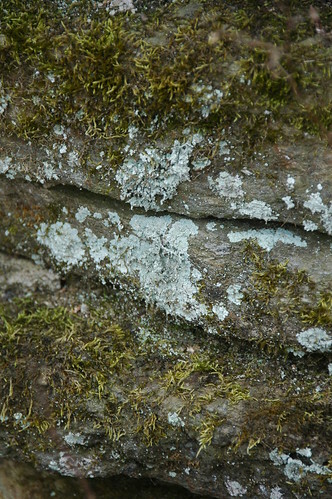 But it pays to stop often and look around, and up, and out. The threatened thunderstorms never materialized. CC's site is adjacent, and we hiked along another trail to get there. There was only a sprinkle of rain. 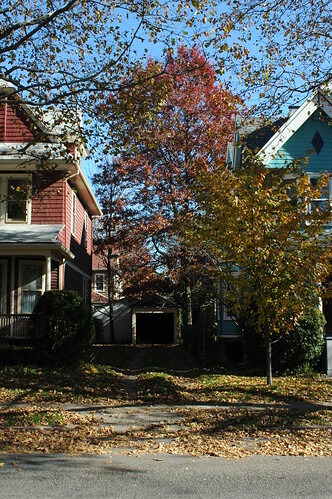 If you have a recently planted street tree in front of your house or building, maintenance is a key factor in ensuring that it continues to be healthy. 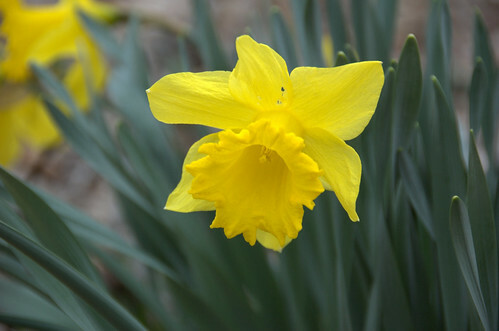 The first year after planting is a critical time. 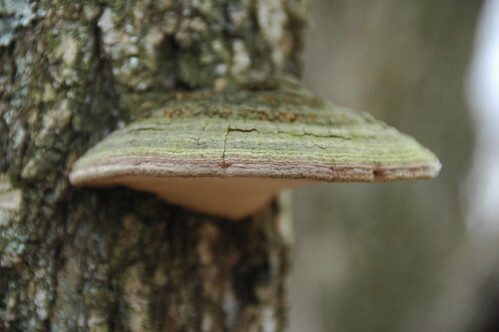 Now that the danger of frost is dissipating, young trees need a lot of water. 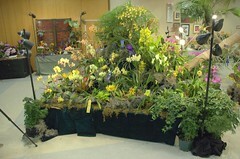 Watering should be done slowly, allowing the moisture to permeate the soil deeply. 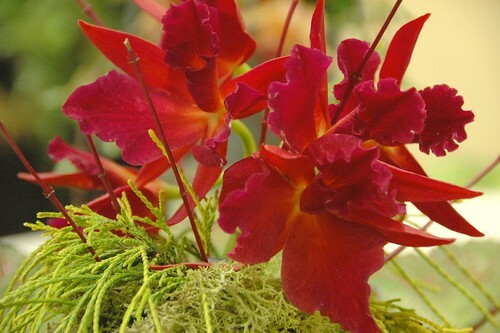 This allows the tree to develop a deep root system rather than depending on shallow roots. They have additional info, and links to other online resources, so check 'em out! Sustainable Flatbush featured in "A Walk Around the Blog"
BRIC, the non-profit Brooklyn arts organization which produces Brooklyn Community Access Television (BCAT), has been doing a bi-monthly series called A Walk Around the Blog, interviews with Brooklyn bloggers talking about their neighborhoods. The latest edition features Anne Pope of Sustainable Flatbush talking about, what else, Flatbush and sustainability. I make an appearance from 1:53 to 2:54 in the video. If you can't see the embedded video above, or if you want to view it at a higher resolution, it's also hosted on blip.tv. 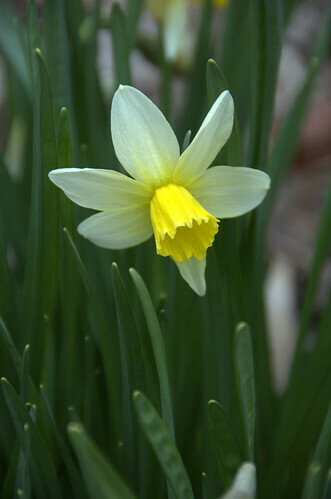 The vernal equinox of 2008 occurs at 05:48 UTC on March 20, or 01:48/1:48am my time, after midnight tonight. And a blogging neighbor wishes everyone a Happy New Year 1387. The way I keep the story in my mind, Winter doesn't occur because Hades is evil/dark/etc. Persephone was not the keeper of the earth. The earth didn't miss her, Demeter did. 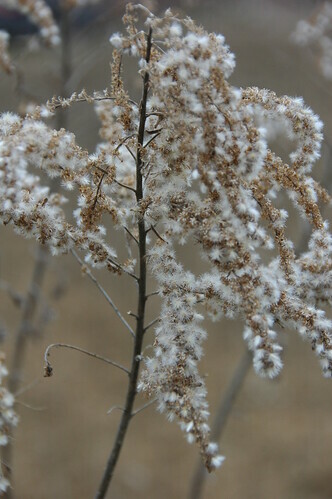 Demeter grieved for her loss, and neglected her gardening duties, and that's why Winter occurs. 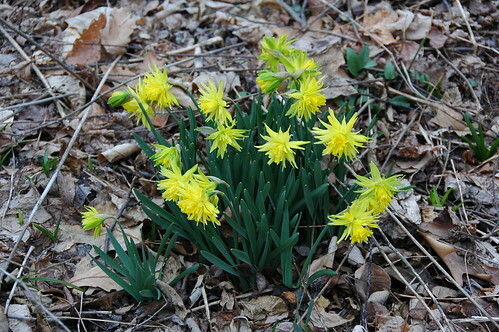 Demeter rejoices at the return of Persephone, which restores her interest in the world, and that's when we get Spring. 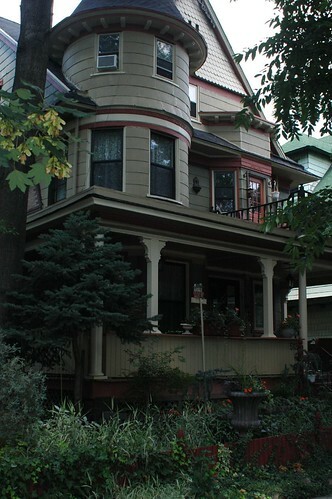 The Landmarks Preservation Commission (LPC) today approved the designation of the city's newest Historic District. 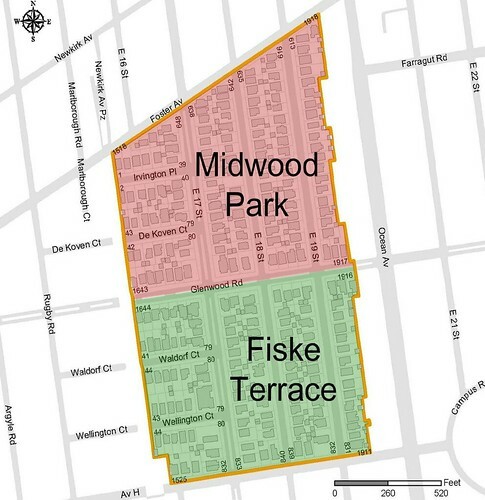 Fiske Terrace-Midwood Park, in Flatbush, becomes the city's 91st Historic District. Bound on the north and south by Foster Avenue and Avenue H, and on the west and east by the Brighton subway line and Ocean Avenue, this district comprises 250 eclectic houses that were largely completed and occupied by 1914, and were built by two prominent local builders and developers. The primary developer of Fiske Terrace, which lies south of Glenwood Road and is named for George B. Fiske, an oil merchant, was the T.B. Ackerson Company, whose owner once boasted of transforming the area “from woods into city in 18 months.” Approximately 75 percent of the houses in the Midwood Park part of the district, which lies north of Glenwood Road, were constructed by the John R. Corbin Company. 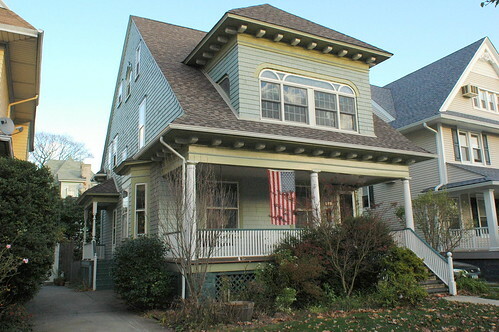 Most of the houses in the district adhere primarily to the popular early 20th-century architectural styles, especially the Arts and Crafts, Colonial Revival and Dutch Colonial Revival styles. 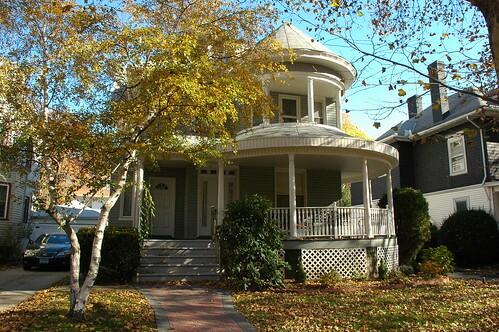 The houses were typically constructed in one of three forms: the box-like foursquare, crowned by a hipped or pyramidal roof; the temple-house, featuring a prominent front-facing gable; and the bungalow, with its low profile, deep porch with thick tapered columns, and broadly overhanging eaves. I heard that bat houses are a possible long-term solution for mosquitos. I guess you put a bat house up and hope that they come and live there. It can take a few seasons to get them to do it but an average bat eats lots of mosquitos a day. Seems strange to try and seduce bats to your house but those mosquitos are terrible. Anyone else heard about these bat houses? The photo above is of a bat house in the East 4th Street Community Garden, which I visited for the first time last November. One of the questions they get when they explain what it's for is, "Where do you get the bats?" If you build it, they will come. We have bats here in Brooklyn. Whether we will continue to have them is in question. "What we've seen so far is unprecedented," said Alan Hicks, DEC's bat specialist. 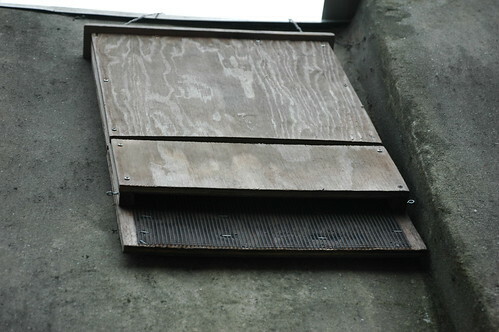 "Most bat researchers would agree that this is the gravest threat to bats they have ever seen. We have bat researchers, laboratories and caving groups across the country working to understand the cause of the problem and ways to contain it." Bat populations are particularly vulnerable during hibernation as they congregate in large numbers in caves-clusters of 300 per square foot in some locations-making them susceptible to disturbance or disease. The vast majority of the hundreds of thousands of bats known to hibernate in New York do so in just five caves and mines. Because bats often migrate hundreds of miles to their summer range, effects on hibernating bats can have significant implications for bats throughout the Northeast. Indiana bats [Myotis sodalis], a state and federally endangered species, are perhaps the most vulnerable. Half the estimated 52,000 Indiana bats that hibernate in the state are located in just one former mine-a mine that is now infected with white-nose syndrome. Eastern pipistrelle [Perimyotis subflavus], northern long-eared [Myotis septentrionalis] and little brown [Myotis lucifugus] bats also are dying. Little brown bats, the most common hibernating species in the state, have sustained the largest number of deaths. The neighborhoods of Victorian Flatbush are of particular interest to historians because in many respects they were the first suburbs. With the newly built Brooklyn Rapid Transit rail line stretching out to Coney Island, the farmland of the Dutch village of Flatbush became a prime location in the early 20th century for what was considered commuter living. 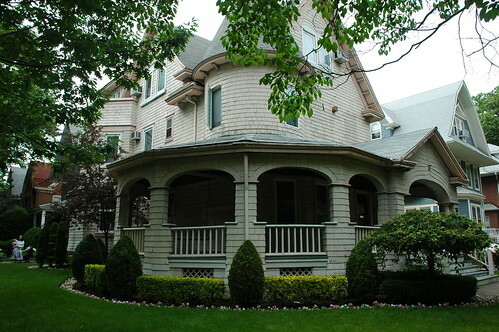 All the neighborhoods featured houses built in the most fashionable of Victorian-era styles, among them Tudor, Queen Anne, Colonial Revival and Georgian. These houses, adorned with carved moldings, fluted columns, copper trimmings and wide, open porches, evoked a lifestyle that went beyond architecture. Exclusive social clubs flourished in the area, as did community associations, many of which have been the driving force in campaigns for historic protection. 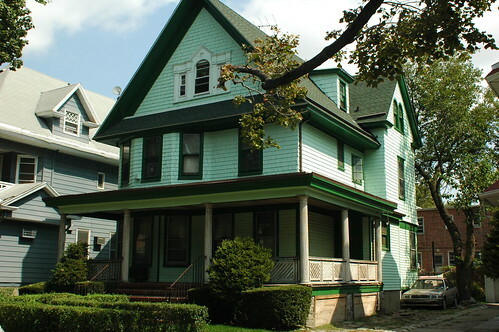 And though the neighborhoods of Victorian Flatbush have distinct characters, nearly all of them have one thing in common: residents eager to protect what is a remarkable and in some cases irreplaceable architectural history. There's a little bit of hand-waving around my neighborhood of Beverley Square West, resulting in several inaccuracies. 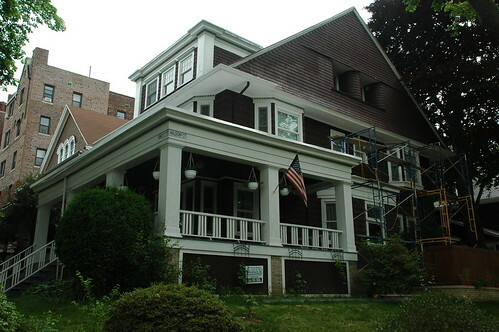 Beverley Square East and West, nestled between Prospect Park South and Ditmas Park [and Ditmas Park West] and completed just after the turn of the 20th century, were Ackerson’s major projects. The developer also got certain streets that run through Beverley Square West rechristened with upper-crust British names: East 12th, 13th, 14th and 15th Streets became Westminster, Argyle, Rugby and Marlborough Roads. Somehow the Times lost one-fifth of Beverley Square West, omitting Stratford Road (East 11th Street) from their description of the neighborhood. Stratford Road is both the westernmost block and the one most at risk from inappropriate zoning in Beverley Square West and Ditmas Park West. The street names originated in the development of Prospect Park South by Dean Alvord. Ackerson's early advertising for developments here still used the numbered designations of East 11th, 12th, and so forth, not the names. 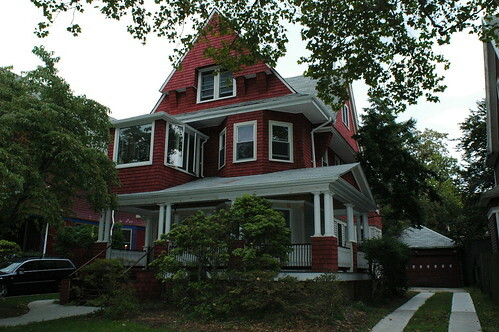 By 1902, the named designations were extended south to what would become Beverley Square West and Ditmas Park West. Our bill from Con Ed, which was around before this building boom of the early 1900s, still uses the numbered designation for our street address. All the original homes of the Beverley Squares were individually designed. Ackerson himself lived in a house in Beverley Square West, and the developer Pounds, a future borough president, lived in Beverley Square East. From what I've learned of the history of the development here, this is not accurate. The houses on Stratford and Westminster Roads are stylistically different from those on Argyle, Rugby and Marlborough. Although no two houses are exactly alike on Stratford and Westminster, neither do they feature much of the architectural details - turrets, round oeil de boeuf (ox-eye) windows, unusual dormers, and so on - visible on nearly every house on the other blocks. I think the houses on these two westernmost blocks were built largely using Victorian pattern books widely available at the time; they were mostly "builders' specials," not designed by architects. They were built earlier, and not by Ackerson. Early Ackerson promotional photos show houses already standing on Stratford and Westminster while Argyle and Rugby are nothing more than empty lots. The earliest neighborhood name I've found for these five blocks is Matthews Park. Matthews Court is one of the short side streets joining Stratford Road and Coney Island Avenue. Not that long ago, "Beverley Square West" referred only to the Ackerson-developed blocks of Argyle, Rugby and Marlborough Roads. 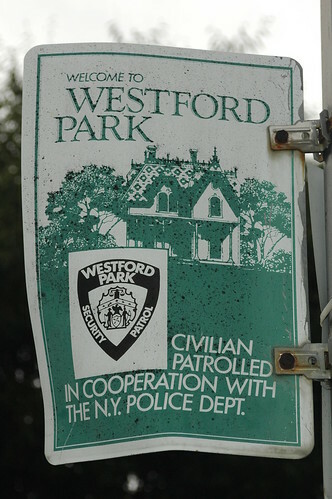 Stratford and Westminster had their own neighborhood association, called Westford Park. These two neighborhood associations joined forces to form the current, five-block Beverley Square West Association.